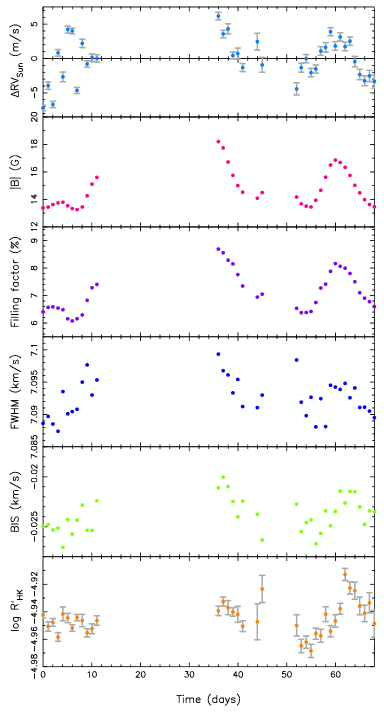 One interesting question is whether close-in hot-Jupiter planets have an effect on the magnetic activity of the host star. 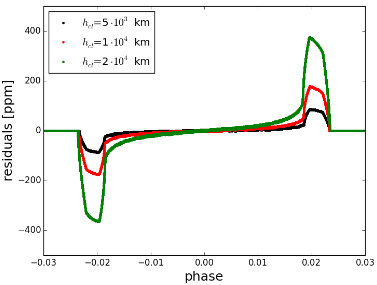 There have been suggestions that star–planet interactions might increase magnetic activity on the star, or that tidal interactions might decrease it. Further, if mass lost from planets forms an absorbing cloud around the star, then it might reduce observable signs of magnetic activity, even if it doesn’t affect the magnetic activity itself. 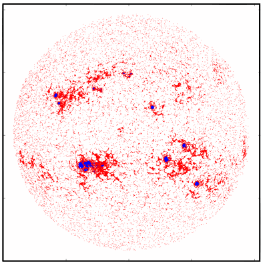 A new paper by Daniel Staab et al, led by the Open University, investigates the issue by looking for markers of magnetic activity in spectra of host stars WASP-43, WASP-51, WASP-72 and WASP-103. 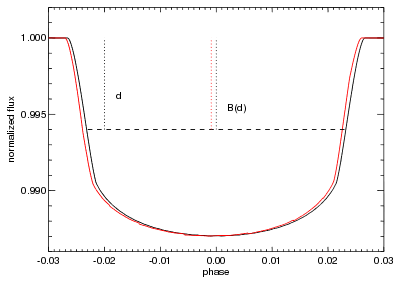 In the following plot, RHK is a marker of magnetic activity, plotted against the temperature (B–V) of the star. The green dots are a large sample of field stars, while the four WASP host stars are labelled in red. 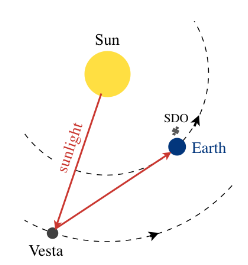 The result is that at least one planet-host, WASP-43, has an abnormally high degree of magnetic activity, while another one, WASP-72, has abnormally low magnetic activity. Staab et al conclude that there is no single factor explaining the differences, and that more than one effect might be in play. As often, a much larger sample of data is needed to investigate the issue. 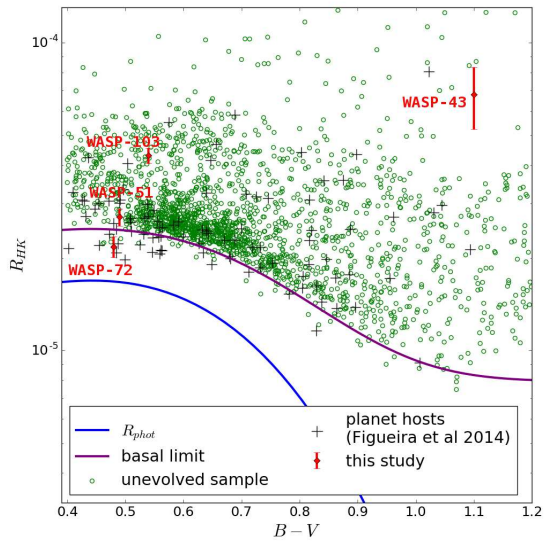 This entry was posted in Hot Jupiters, WASP planets and tagged magnetic activity, WASP-103, WASP-43, WASP-51, WASP-72 on December 9, 2016 by waspplanets.